Utagawa Kunisada/Toyokuni III (1786-1865) Stories of the Faithful Samurai: Matsumoto Koshiro V as: Yoshida Chuzaemon Kanesuke (The Syllable Yo), 1864. Oban. This series was designed by Kunisada at the age of 79 in the year 1864, and the signature, nanajukyu sai Toyokuni hitsu, ("drawn by Toyokuni in his 79th year") explains this with pride. To reach that age at all and still be active was a considerable achievement anywhere in the mid-nineteenth century and these works are remarkable for that. Kunisada (or, as he would adopt, Toyokuni III) ran a big studio and the specifics of the prints would have been worked on by pupils… nevertheless these are great prints. The last series by this great artist were widely anticipated, they reflect his fame and the admiration he attracted… the last great 1860’s series are among his best, notable for the originality of the design and quality of the production as well as the boldness and the confidence of a great artist whose career has been uniformly triumphant. Think of the late great works of Picasso or Matisse. It seems to be the last of his great series on the subject of the 47 Ronin. Here the ronin are ordered by the the 47 syllables of the Kana-alphabet and they are pictured in the traditional black and white dogtooth costume of the leaderless samurai. 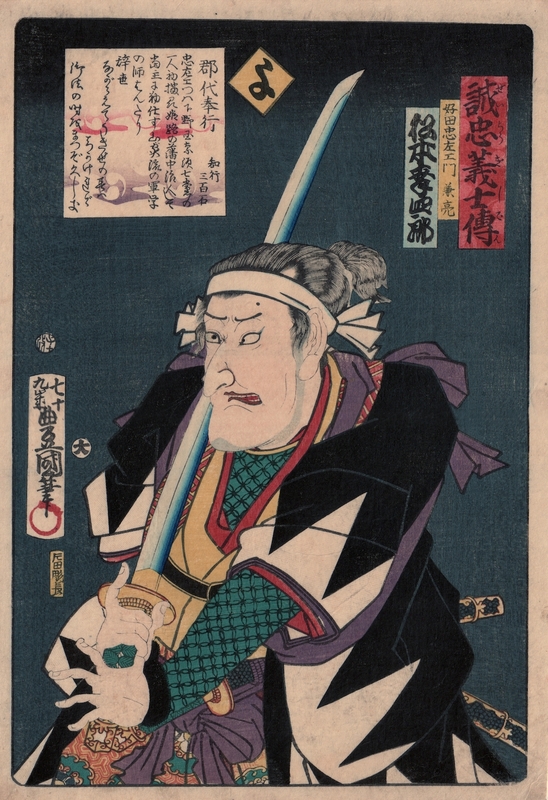 Each of the portraits in this large series of fifty prints shows the various characters engaged in their last fight against their opponent, prince Enya Hangan, which took place during the night at the beginning of the year. Lord Asano of Ako was provoked by Kira Kozukensuke into drawing his sword in the shogun's palace, for which he was forced to take his own life. Forty-seven of his retainers became Ronin - samurai without masters. They vowed revenge on their leader and attacked Kira's palace the following year, decapitating him and carrying his head to lay on Asano's grave. They in turn took their own lives. Aside from the outstanding designs, the series is notable because, in spite of an existing ban on artists using real historical names for personalities living before 1572, all ronin are given their original names and not the aliases used for more than 150 years in prints and other popular literature. The heroes are ordered by the letters of the Kana alphabet (the syllabic Japanese writing system where each character corresponds to an individual sound), and the syllable is illustrated in the yellow rhombus at the top of the print. The syllable illustrated here is "yo". Of course a further twist to this series is that the real subject is not the ronin, or the daring use of their real names for the first time in print, but the actors, who are portrayed in the role of the samurai. In this case, the real subject for the Edo audience was the portrait of the Kabuki actor Matsumoto Koshiro V.
This is a great, great print from the master of the theatrical portrait. Colour, condition and impression are all excellent. Blind embossing to the robes.